Coalgebra is an abstract framework for the uniform study of different kinds of dynamical systems. An endofunctor $F$ determines both the type of systems ($F$-coalgebras) and a notion of behavioral equivalence ($\sim_F$) amongst them. Many types of transition systems and their equivalences can be captured by a functor $F$. For example, for deterministic automata the derived equivalence is language equivalence, while for non-deterministic automata it is ordinary bisimilarity. The powerset construction is a standard method for converting a nondeterministic automaton into an equivalent deterministic one as far as language is concerned. In this paper, we lift the powerset construction on automata to the more general framework of coalgebras with structured state spaces. Examples of applications include partial Mealy machines, (structured) Moore automata, and Rabin probabilistic automata. Silva, A.M, Bonchi, F, Bonsangue, M.M, & Rutten, J.J.M.M. (2010). 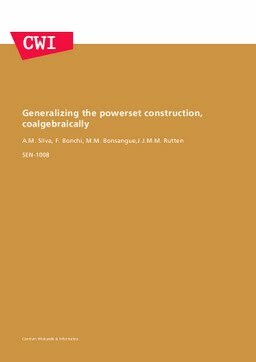 Generalizing the powerset construction, coalgebraically. Software Engineering [SEN]. CWI.